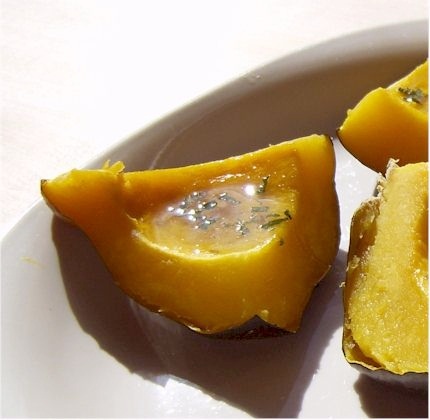 Place the prepared squash cut side down on a baking sheet or in a baking dish. Bake for 45 minutes, or until tender. Keep in mind, if you leave it cut side down after removing it from the oven, it will continue to soften and cook a bit. Remove the margarine from the heat and stir in the honey (or other sweetener) and sage. Allow the flavors to sit and meld while your squash cools for a few minutes. Cut each squash half into quarters (this is how I like to serve it), and evenly spoon the sweet sage butter into the squash sections and serve.